THE plain words of both the Old and New Testaments predict that the "Final Battle" will begin in Israel, with an attack on the Holy City, Jerusalem, and finally engulf the entire world. In Revelation, it is told this way: "Satan shall be loosed out of his prison, and shall go out to deceive the nations which are in the four quarters of the Earth, Gog and Magog, to gather them together to battle. They surrounded the camp of God's people, the city he loves. But fire came down from Heaven, and devoured them." 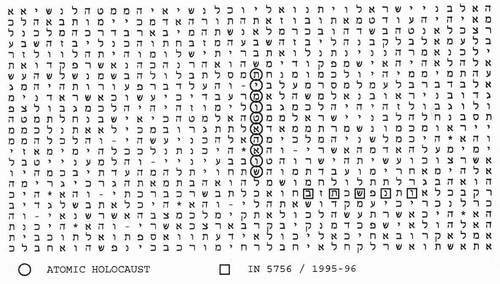 In the Bible code, only one world capital matches either "World War" or "atomic holocaust" -"Jerusalem." On the day Rabin was killed I found the words "all his people to war" encoded in the Bible. The warning of total war was hidden in the same code matrix that predicted the assassination. "All his people to war" appeared right above "assassin will assassinate," in the same place as "Yitzhak Rabin." I immediately flew back to Israel. The Rabin assassination changed everything. It was the first moment that the Bible code seemed entirely real to me, the moment when what was encoded became life and death fact. And now the code warned that the entire country was in danger. While Israel mourned Rabin, I worked with Eli Rips at his home outside Jerusalem. We tried to decode the details of the new prediction-"all his people to war." Rips and I searched the Bible code for signs of a catastrophic conflict. We didn't yet know that the code warned of an atomic attack on Jerusalem. We had not yet found "World War." But in the first computer run we did find the words "Holocaust of Israel." The "holocaust" was encoded one time, starting in a verse of Genesis where the patriarch Jacob tells his sons what will befall Israel in the "End of Days." "The first question is when," said Rips, and he immediately checked the next five years, every year in the rest of the century. Suddenly he paled, and showed me the results. The current Hebrew year, 5756-the end of 1995 and most of 1996 in the modern calendar-appeared in the same place as the predicted new "holocaust." It was a starkly frightening table. The year actually joined "Holocaust of Israel." It was a perfect match. "5756" was spelled out in a verse of the Bible where the "holocaust" was encoded. The year 2000, 5760 in the ancient calendar, was also a very good match. But the last year of the century seemed distant at that moment. In the second week of November 1995, in the days following the Rabin assassination, the overwhelming fact was the clear encoding of the "holocaust" with the current year. "What are the odds?" I asked Rips. "A thousand to one," he said. "What could cause a holocaust in modern Israel?" I asked. The only thing we could imagine was a nuclear attack. We now found it encoded in the Bible, a startling statement of modern danger in the ancient text-"atomic holocaust." "Atomic holocaust" appeared only once. Three years in the next five were encoded in the same place-1996, 1997, and the year 2000. But again the year that caught our attention was the current year, 5756. "In 5756" was encoded just below "atomic holocaust." "What are the odds that could happen twice by chance?" I asked. "A thousand times a thousand," said Rips. There were indications of danger all through the rest of the century, and beyond. If the Bible code was right, Israel would be in unprecedented danger for at least five years. But only one other year was as clearly encoded with "atomic holocaust" as 1996-1945, the year of Hiroshima. We looked again at the phrase "all his people to war," the statement that appeared with the Rabin assassination. The same words - `all his people to war"-were also encoded with "atomic holocaust." In fact, those words appeared three times in the plain text of the Bible, and were encoded twice with "atomic holocaust." Rips again calculated the odds. Again, they were at least a thousand to one. I asked Rips how likely it was that each element of the predicted danger -the war, the holocaust, the atomic attack-would be encoded against such high odds. "We have no way to calculate it," said Rips. "But it's in the range of many millions to one." 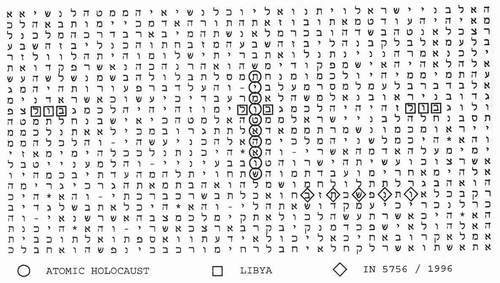 THE Bible code seemed to be predicting a new holocaust, the destruction of an entire country. If a nuclear war broke out in the Middle East, it would almost certainly trigger a global conflict, perhaps a World War. And the events forecast were actually happening as predicted. A Prime Minister was already dead. I could not simply wait to see if the next prediction also came true. We had information that might have saved Rabin, but failed to prevent his murder. Now we had information that might prevent a war. It was, for me, a truly bizarre situation. I had by chance stumbled onto a code in the Bible that clearly did reveal future events. But I was not religious, I didn't believe in God, and it all made no sense to me. I had been a reporter at the Washington Post and the Wall Street Journal, I had written a book based on ten thousand documents, I was used to hard facts in our three dimensions. I was not a Bible scholar. I did not even speak Hebrew, the language of the Bible and the code. I had to learn it from scratch. But I had found Rabin's assassination encoded in the Bible. Hardly anyone else knew that the code even existed. Only Rips knew that it also seemed to predict an atomic attack, another holocaust, perhaps a World War. And he was a mathematician, not a reporter. He had no experience dealing with government leaders. He had not been willing to warn Rabin. He was not ready to tell the new Prime Minister, Shimon Peres. All of my reporter's instincts said that this new danger could not be real. All the Arab leaders had just come to Rabin's funeral. The peace seemed more secure than ever in late 1995. "All his people to war" seemed a very remote threat. There had been no real war since Israel defeated Egypt and Syria in 1973. There had been no internal uprising since the Intifada ended with the Rabin-Arafat handshake in 1993. There had not even been a major terrorist attack in three years. Israel was more at peace than it had ever been since the modern state was established after World War II. An "atomic holocaust" seemed more than unlikely. A "World War" seemed beyond belief. But I also had never really believed that Rabin would be killed. I just knew that his murder was encoded. And now Rabin was dead. He was killed, exactly as predicted, in 5756, the Hebrew year that began in September 1995. I looked again at the new computer print-outs. 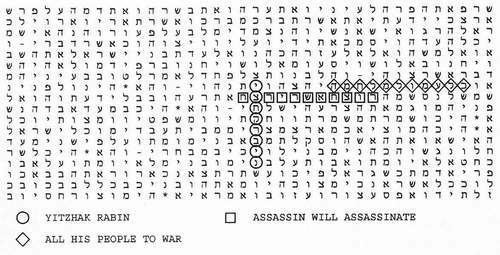 "The next war" was encoded once in the Bible. "It will be after the death of the Prime Minister," stated the hidden text. The names "Yitzhak" and "Rabin" were encoded in the same verse. I was now certain that the Bible code did reveal the future. But I still did not know if every prediction came true. And I still did not know if the future could be changed. As I lay awake wondering how I would get to Shimon Peres, and what I would tell him, the answer to the bigger question suddenly hit me. In Hebrew, every letter in the alphabet is also a number. Dates and years can be written with letters, and in the Bible code always appear that way. The same letters that spelled out the current year, 5756, also formed a question. The letters that stood for the numbers 5756, the year of the predicted holocaust, clearly spelled out a challenge for us all-"Will you change it?" Less than a week after Rabin's death, I sent a letter to the new Prime Minister, Shimon Peres, alerting him to the new danger encoded in the Bible. "There is a hidden code in the Bible that revealed the murder of Rabin a year before it happened. "The information about the threatened `atomic holocaust' of Israel is detailed. The source of the danger is named, and it is predicted for this Hebrew year, 5756. "I believe the danger can be averted, if it is understood. This is not religion. The solution is entirely secular." The Prime Minister's first reaction was disbelief. "Astrologers and fortune-tellers are contacting me all the time with one warning or another," Peres told his long-time friend, a prominent member of the Labor party, Elhanan Yishai, when he delivered my letter on November 9. Less than a week had passed since Rabin was killed. Peres had no time for predictions in a Bible code. The Prime Minister's press secretary, Eliza Goren, was equally skeptical. She had been standing next to Rabin when he was shot, she had seen the letter I sent him a year earlier warning of the assassination, and still she could not believe the code was real. "We're all rational people here, Michael," she said. "This is the twentieth century." I am a reporter, not a fortune-teller. I did not want to make predictions. I did not want to be the man who flew around the world saying, "Beware the Ides of March." And I had no idea if the danger of an "atomic holocaust" existed outside of the Bible code. But American nuclear terrorism experts told me that it was more than plausible. In fact, they said it was a near miracle it hadn't happened yet. The former Soviet Union was an open market, the radical Arab states were the most likely buyers, and Israel was the obvious target. "Never before has an empire disintegrated while in possession of 30,000 nuclear weapons, 40,000 tons of chemical weapons, tons of fissile materials, and tens of thousands of scientists and technicians who know how to make these weapons, but do not know how to make a living," a U.S. Senate report on the Soviet black market stated. A Russian official who investigated the theft of enriched uranium from a nuclear submarine base in Murmansk put it more simply: "Even potatoes are much better guarded." I didn't have to talk to the experts to know that the danger was real. I had been in Moscow in September 1991, just weeks after the failed coup against Gorbachev, when the Soviet Union seemed to collapse overnight. Everything was up for sale. I remembered meeting with a group of Russian military scientists, including some of the top nuclear weapons experts. None could afford a decent shirt. The cuffs of their sleeves and their collars were all torn and frayed. The senior scientist present, who had designed a major Soviet missile system, took me aside and offered to sell it to me. Obviously, Arab terrorists would have no trouble buying a bomb. The danger stated in the Bible code might be real. But I had no way to confirm it, and no way to prevent it. Several days after I arrived back in the United States, I finally reached the deputy chief of Israeli intelligence, Gen. Jacob Amidror. I expected him, like Peres, to dismiss the Bible code. The upper ranks of the Israeli government were then defiantly secular, and the military and intelligence officials were more secular than anyone. I immediately assured Gen. Amidror that this was intelligence, not religion. "I'm not religious," I told him. "I'm an investigative reporter. To me, the Bible code is information, not religion." "How can you say that?" replied Amidror. "How can you say it's not God? This was encoded in the Bible 3000 years ago." Amidror, it turned out, was religious. He not only accepted the code as real, he accepted it as the word of God. In the almost totally secular higher ranks of Israeli intelligence, I had reached the one man who needed no assurance of the Bible code. But Amidror said he could find no evidence of the stated danger in the real world. "If there's a danger, it's from the other realm," he said. "In that case, all we can do is pray." JUST after New Year's day in 1996 Peres' top military advisor, Gen. Danny Yatom, called me in New York. "The Prime Minister read your letter, and he read your letter to Rabin," said Yatom. "He wants to meet with you." I flew back to Israel, and to prepare for my meeting with Peres, went back to work with Eli Rips. We re-checked all the math. Rips typed "holocaust of Israel" and thecurrent Hebrew year "5756" into his computer. They matched. The odds were a thousand to one. He typed in "atomic holocaust" and the year. Again they matched. The odds were more than a thousand to one, 8 in 9800.
Who would launch an atomic attack against Israel? Who was the enemy? Crossing "atomic holocaust" were the words "from Libya." And "Libya" appeared two more times on the same table. The name of Libya's leader, "Kaddafi," was encoded in the last book of the Bible, in a verse that stated: "The Lord shall bring a nation against thee from afar, which will swoop down like a vulture." And the words "Libyan artillery" were also encoded, again with the current year, "5756." The odds that the weapon would be encoded with the year were again at least a thousand to one. 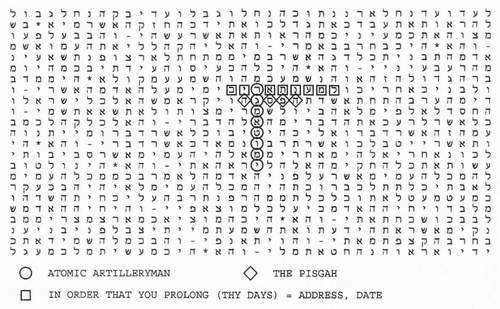 "Atomic artilleryman" was also encoded in the Bible, and the exact location seemed to be stated. It was "the Pisgah," a mountain range in Jordan, the same mountains Moses climbed to see the Promised Land. When I checked the plain text of the Bible, the first verse that mentioned the Pisgah also stated, almost openly, "Weapon here, in this place, camouflaged." It seemed beyond belief that the actual words of the Old Testament, written 3000 years ago, would reveal the location of an atomic weapon about to be fired against Israel. And yet, if the danger was real, if a "holocaust of Israel," if an "atomic holocaust" was imminent, then it was perfectly logical. If there really was a code in the Bible, if it really did tell the future, then of course this very moment when the land of the Bible might be obliterated, when the people of the Bible might be wiped out, would be the warning that was most clearly encoded, important enough even to be stated in the plain text. "It's very consistent," said Rips. "It's clearly intentional." Rips confirmed that the atomic attack was clearly encoded, against very long odds, that mathematically it was beyond chance. But he was nervous about my meeting with Peres. "The Almighty may have guarded the future from the eyes of anyone not intended to see it," said Rips. On January 26, 1996, 1 met with Shimon Peres at the Prime Minister's office in Jerusalem, and warned him of the encoded atomic attack. At our meeting, the Prime Minister asked only one question: "If it's predicted, what can we do?" "It's a warning, not a prediction," I answered. I told him I believed that the Bible encodes probabilities, that nothing was pre-determined. "What we do determines the outcome," I said. I gave Peres two computer print-outs from the Bible code. One showed the words "holocaust of Israel" encoded with the current Hebrew year, 5756. On the other, the words "atomic holocaust" appeared, again with the current year. I told him that the odds of that happening by chance were at least 1000 to 1. Peres interrupted: "A thousand to one it will happen?" No one could state the odds of the holocaust actually happening, I explained. No one yet understood the code well enough to do that. But the odds against 1996 twice matching the danger in the code were at least 1000 to 1. Mathematically, it was beyond chance. "If the Bible code is right, Israel will be in danger for the rest of this century, for the next five years," I told the Prime Minister. "But this year may be critical." The source of the danger appeared to be Libya. I showed Peres that in the code "Libya" crossed "atomic holocaust." "I don't know if that means an attack will be launched from Libya, or from elsewhere by terrorists supported by Libya," I said. "My own guess is that Kaddafi will buy an atomic device from one of the former Soviet republics, and that terrorists will use it against Israel." Peres took it all in quietly. It was clear that he had carefully read my letter to him, and that he had not forgotten the letter I sent Rabin a year before the assassination. He asked no deep philosophical questions about the Bible code. He never mentioned God. He did not ask if his own name was encoded, a natural question after Rabin was killed. He had only one thing on his mind, the stated danger to Israel. He did not seem surprised by the threat of an atomic attack. Peres had been in charge of creating Israel's own nuclear weapons at a top secret military base in Dimona. He knew how easily a nuclear device could be converted to terrorist use. "I don't know if Israel is in any actual danger," I told the Prime Minister before I left. "I only know that it is encoded in the Bible." The next day, January 27, 1996, Libya's leader Muammar Kaddafi made a rare public statement. He called on all Arab countries to acquire nuclear weapons. "The Arabs, who are threatened by Israel, have a right to buy nuclear weapons in any way possible," he said. When Kaddafi issued his statement, I was on top of Mount Nebo in Jordan, the peak of the Pisgah mountains that Moses climbed to see the Promised Land, the range of mountains above the Dead Sea that the Bible code identified as the launch site for an atomic attack. 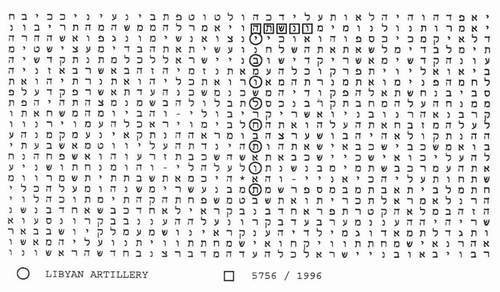 There seemed to be an almost open statement in the Bible code that the weapon was here. "Under the slopes of the Pisgah" crossed "atomic artilleryman." And the line right above that was like the X on a map. There, the original verse of the Bible read, "In order that you prolong thy days on Earth." It was a curious passage to cross "atomic artillery," and the same verse also crossed "atomic holocaust." It seemed to offer hope that the attack could be prevented. A hidden message in that verse of the Bible told how. In Hebrew the same letters that spell out "in order that you prolong" also spell the words "address" and "date." The address was clear. It was the mountain range in Jordan, "the Pisgah," the location of the atomic weapon that appeared right below "address." But we could not find the date. We knew where to look, but not when. Nonetheless I went there, and that's where I was standing when Kaddafi made his threat, the day after I met with Peres. There were three miles of barren hills and desert wadis "under the slopes of the Pisgah," any one of which could conceal an artillery piece, or missile launcher. Nuclear terrorism experts back in the U.S. had told me that an atomic artillery shell could be carried in a backpack by one strong man, easily by two men. And there were thousands of atomic artillery shells scattered throughout the former Soviet Union, each capable of destroying an entire city. It was eerie to stand there, where Moses might have stood, and look across the Dead Sea at Israel, within plain sight on the other side of the water, knowing that somewhere in the surrounding hills and wadis Libyan terrorists might be preparing to launch a nuclear warhead against Tel Aviv or Jerusalem. I was back in Jerusalem one day later to meet with Danny Yatom, the General who set up my meeting with Peres and who was about to be named chief of Israel's famed intelligence agency, the Mossad. Yatom was just back from the failed Washington peace talks with Syria, but he had already talked to Peres about our meeting. "Did he take it seriously?" I asked Yatom. "He met with you," said the General. We discussed in more detail the danger of an "atomic holocaust" encoded in the Bible. Yatom wanted to know when and where. I told him what was indicated, but added, "The place, the date may be only probabilities. We might be wrong about every detail, but right about the overall danger." Yatom asked me the same question Peres had asked-"If it's encoded what can we do?" "You can't stop a comet from striking Jupiter," I said. "But you can certainly stop Libya from attacking Israel." Three days later, in a speech in Jerusalem, Peres for the first time said in public that the greatest danger facing the world was that nuclear weapons would "fall into the hands of irresponsible countries, and be carried on the shoulders of fanatics." It was a clear re-statement of the warning in the Bible code-that Kaddafi would buy an atomic device, and that Libyan-backed terrorists would use it against Israel. But if the Bible code was right, Peres was wrong. It was not the greatest danger facing the world. "If this is real at all," I told Gen. Yatom, "it's the beginning of the danger, not the end."